Along with the valid arguments for each side, there are some misconceptions that are simply incorrect and should be put aside when considering a tablet or smartphone. In most cases, this is simply not true. Consumer touchpanels are usually of a far higher specification than proprietary panels, at a much lower cost. It is entirely feasible to use consumer touchpanels as dedicated devices which would compare favourably against proprietary panels. The typical advantage of proprietary panels is their wired proprietary interface, but with this fast changing to Ethernet or Wi-Fi, this advantage is no longer relevant since consumer touchpanels often have Ethernet or Wi-Fi options as well. As with any new product, there will be some time required to learn the ins and outs of what is possible and how to do it. Software such as iViewer and guiDesigner are relatively simple to use, while providing functionality surpassing many other similar software offerings. Programmers with backgrounds in similar systems will find the transition particularly easy. Choose the correct app, and the right devices to control and there are certainly apps out there that can control everything. Once again, it’s a case of moving away from the proprietary control systems and apps and choosing one that publishes open protocols to allow for simple control of many different systems from a single app. And if for some reason you really do need to switch apps, applications such as iViewer allow the programmer to perform the app switch from within the programmed GUI interactively. This is an incorrect assumption and if this is found to be an issue, it is usually a case of incorrect programming, a misconfigured network, or choosing an inferior application. All things being equal, with the right programmer and the right app, the system will be just as quick, if not quicker. A proprietary system is often slower as it bottlenecks through a single controller instead of communicating with individual devices concurrently. This is particularly true with high bandwidth devices such as media servers. In the past this was true because consumer devices were so much further ahead in technology and had glass screens for capacitive touch displays. So, when a device was dropped, it would break easier than a resistive touch screen. These days even proprietary devices have embraced capacitive technology for obvious reasons and hence, are just as easy to break. Protective cases are also much more readily available for consumer devices. 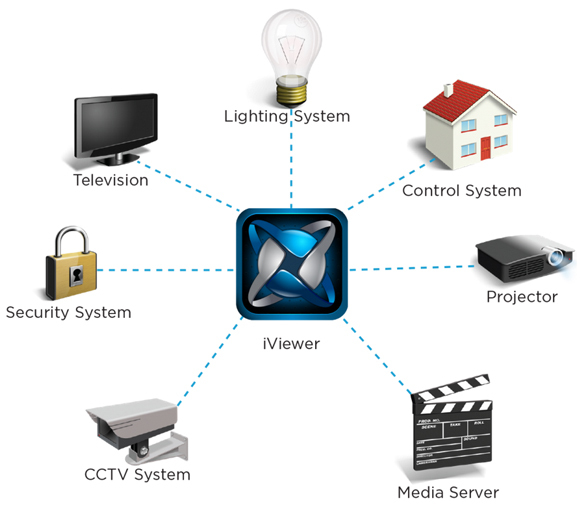 CommandFusion's iViewer has been at the forefront of control applications for consumer devices since 2008. It provides advanced control functionality for an iOS or Android device. IViewer software allows two-way remote control of any hardware or software capable of TCP/IP or UDP communications, directly from iOS or Android devices. IViewer works seamlessly with our own CommandFusion hardware, as well as other systems from Crestron, AMX, Control4, Global Cache, and any other product that can be accessed over Ethernet. Our powerful iViewer automation engine lets you create beautiful, dynamic and animated users interfaces. Using our guiDesigner software, you have full control over how each page looks and interacts. You can fully customize the layouts, themes and interactions. Easily program anima- tions and page transitions. Create commands and macros assigned to on-screen objects. Assign actions to user gestures, and much more. Advanced data processing is possible via our powerful data analysis engine, allowing you to automatically take action upon events received from the remote devices. In depth networking includes TCP Client and Server modes, as well as UDP with broadcast and multicast support. What an integrator chooses to put in to installations comes down to choosing the right product for the right job. Whilst proprietary panels may still be the better choice in some jobs from the point of reliability, this option is fast becoming difficult to justify from the point of cost, performance and feel. This series of articles serves to provide the pros and cons so that end users can be presented the facts to make their own informed choice. Regardless of the direction chosen, what is most important is to stay informed so that decisions can be made correctly. Technology is constantly changing, and not always in the right direction – a decision that was right yesterday may be wrong today.